Anyone who resides in the Lyons Regional Library District (roughly the Town of Lyons and the surrounding unincorporated areas) may obtain a library card at no charge. The initial library card is free, and a replacement fee of $2.00 is charged for lost cards. Adult Resident Cards are issued to any resident in the Lyons Regional Library District who furnishes valid picture identification as well as verification of name, street address, and mailing address (e.g. a utility bill, tax receipt, or other documentation that shows the user’s name and present address). Juvenile Cards are issued to any minor resident under 18 years of age, accompanied by a parent/guardian, upon presentation of the parent/guardian library card or alternate verification of address from the parent/guardian. The parent/guardian is ultimately responsible for the materials borrowed and fees and charges made to the account. 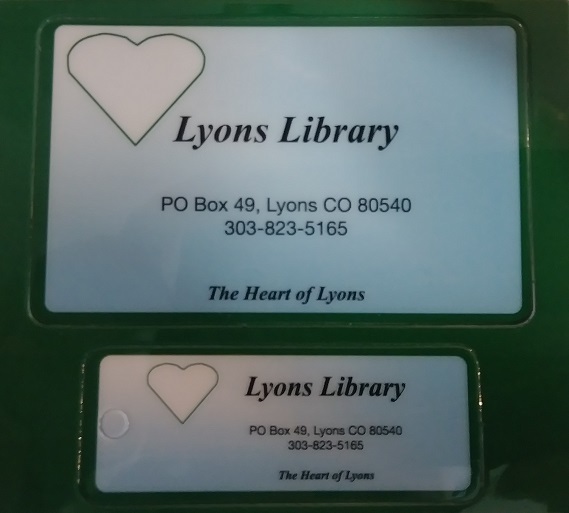 Youth card holders are able to request materials from the Lyons Regional Library as well as any of the libraries that are in the AspenCat system. It is the policy of the Lyons Library that the parents and legal guardians, not the library staff, have the responsibility for guiding and directing the reading, listening, and/or viewing choices of their own minor children. Visitor Cards may be issued to anyone who is not a resident of the Lyons area after presentation of a valid driver’s license. Visitor cards have a checkout limit of two items per family member, and the checkout period is 14 days with two renewals if the items are not on hold for another borrower. The library card must be returned with the borrowed library materials. If materials are not returned, the materials will be deemed stolen, and a report will be made with law enforcement for recovery. The Lyons Regional Library is a member of AspenCat Union Catalog. This collaboration allows resource sharing with more than 100 other Colorado libraries with access to over 1 million items. Collections may be searched at a library workstation or online from our website on the Books and More page. Library staff members are always available to assist in person or by phone at 303-823-5165. Please report any damaged items to library staff when returning materials. Lyons Regional Library staff understand problems may be due to normal wear or may have occurred in a prior checkout. For information on borrowing items, please visit the Borrowing Materials page. We offer three public computers for patron use plus an Apple Macintosh laptop. You may also use your own device and connect to our WiFi network under “LibraryPublic.” No password is required. Both wireless access and library computers use a public network. Data may be vulnerable to access by others. Working with confidential material on any public network is risky. Please check in with the front desk when using any library computer so that we may know when the computers are in use as well as keep accurate statistics. We will ask for a license or some form of identification to use the laptop or other portable electronic device, if we have one available. Patrons can print from all computers. Copies are 10 cents for black and white copies and 50 cents for color copies. Please pay at the front desk. 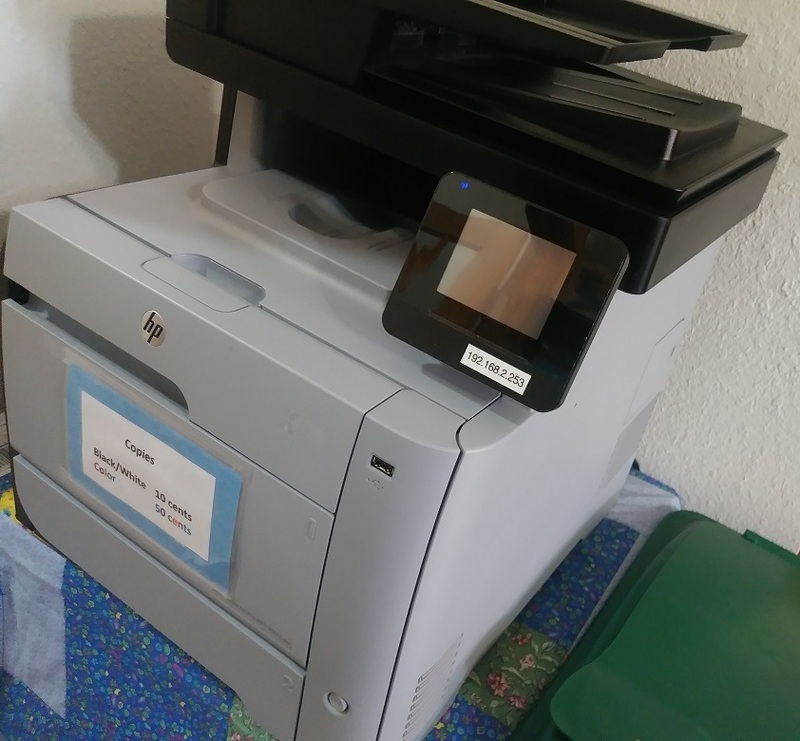 Patrons may also scan items from our copy/scan machine. We are happy to show you how. Except as set forth in subsection (2) of this section, a publicly-supported library or library system shall not disclose any record or other information which identifies a person as having requested or obtained specific materials or service or as otherwise having used the library. Any library or library system official, employee, or volunteer who discloses information in violation of this section commits a class 2 petty offense and, upon conviction thereof, shall be punished by a fine of not more than 300 dollars. Account checkout history is electronically captured as part of the patron record. Patrons can delete this themselves in the AspenCat Catalog or Lyons Regional Library staff are happy to assist.